One of the challenging things about ice fishing for perch on Lake Saint Clair is finding a good spot to fish. The lake is huge and doesn't have many distinct drop-offs making it difficult to pinpoint the hot spots. Most of the popular access spots will hold perch but an angler should always check the local reports to see if any areas are doing better than the others. The key to finding a good spot on Lake Saint Clair for perch is to stay mobile and try new areas until you find structure that will hold perch. Areas that hold perch on Lake Saint Clair include slightly elevated humps, transition areas from sand to clay and most importantly weeds. Once you find a hole that looks like it has good structure around it, the actual perch fishing begins. An angler should have four to five fishing rigs set up with different lures. This allows the fisherman to easily switch between lures to see what is working the best that day. Go to lures on Lake Saint Clair for perch are jigging raps made by Rapala, fat boy lures made by Lindy and Ken's spoon available at local bait-shops in the area. Popular live bait on Lake Saint Clair for perch include minnows, wax worms,spikes(maggots) and wigglers(mayfly larvae). Lake Saint Clair is a relatively shallow lake with most areas being less than ten feet deep. The lake does have some deeper areas but they are not safe for ice fishing. The majority of the time, you will be fishing for perch in shallow water and after January the water will be very clear. The clear view lets anglers with a shanty sight fish for perch. This is an advantage because it allows the fisherman to see what is beneath them and move if they are not seeing perch. This is also what makes ice fishing for Lake Saint Clair perch so fun. Watching a jumbo perch take your minnow is an absolute blast! 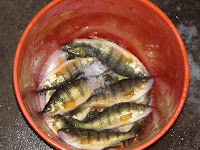 The thing about Lake Saint Clair is that anybody can go out and catch perch after perch but they will usually be dinks. The secret to consistently catching jumbo perch is being able to sight fish. This allows the angler to be selective with the perch he/she is catching. When the perch are small, pull your jig away from them and wait for the bigger ones. If the small ones stick around long enough, the jumbos will come in to see what the commotion is about. This is when the fun begins, try changing up your baits and lures to get them to bite. If you are seeing perch but they will not bite, a unique rule on Lake Saint Clair allows you to spear them. Who needs to hear that you were quite recently fortunate, when you skillfully handled that trophy angle! Setting accentuation on ability, instinct and having the best accessible kayak angling gear is commensurate to future calculating achievement. Frequently utilize the cast top water traps to surfacing fish according to the guided angling trips.